You must live within the SBCC service area to qualify for any scholarship listed below. Camp/Recreation, Primary School Education Support and Direct Financial Aid Scholarship awards may not exceed $300 per person each calendar year. The Automobile Modifications/Adapted Driving and Post-secondary Education scholarships may be applied for in addition to the other scholarships. 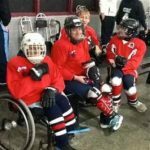 Community recreation programs serving individuals with Spina Bifida may also apply for financial support for activities. See the Organization Contribution Guidelines and Application for more information.